Utu Productions - 124/108 min. Cast: Anzac Wallace; Bruno Lawrence, Wi Kuki Kaa, Tim Elliott, Kelly Johnson, John Bach, Tania Bristowe, Ilona Rodgers, Faenza Reuben, Martyn Sanderson, Merata Mita. Crew: Screenplay: Geoff Murphy, Keith Aberdein; Photography: Graeme Cowley; Editor: Michael Horton; Music: John Charles; Costume Designer: Michael Kane; Production Designer: Ron Highfield; Producer and Director: Geoff Murphy. 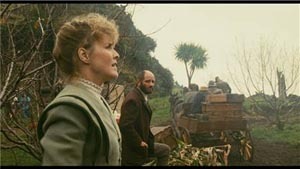 New Zealand in 1870 - a friendly Maori village is massacred by colonial troops and discovered by army scout, Te Wheke, whose own people are among the dead. He turns on his employers and takes up his warrior chieftain past, seeking utu (revenge), he engages in guerilla warfare against the Pakeha (Europeans). One of those attacked is a farmer whose wife is killed and house burned. The farmer in turns seeks his vengeance. Shot in the Hawke's Bay area near Hastings, Napier and Te Pohue. The original score was the first NZ feature to use the full New Zealand Symphony Orchestra. One to put on your "must see" list, but see 'Utu Redux' for the director's restored version. Used PAL VHS copies will be about $20nz or 10eur. Used NTSC VHS copies sell for about $25us. The vhs format is 1.33:1. New R4 PAL DVDs have been available from Australian sources for about $15au. It is presented in a 1.66:1 format with a 2.0 dolby digital English soundtrack. As of Nov. 2005, the only R1 NTSC distributor (Kino) is no longer providing this title. Therefore remaining R1 copies are starting to climb with the asking price of over $100us for new copies and used going for at least $50us. It is presented 1.66:1 non-anamorphic with an English only 2.0 dolby digital sound and no extras. It's length is 104 minutes. In February 2015, a 1.33:1 formated, not the original 1.85, German R2 DVD version was released with the original spoken English as well as a German language 2.0 soundtrack. It has no subtitles nor extras and sells for 10-12eur. 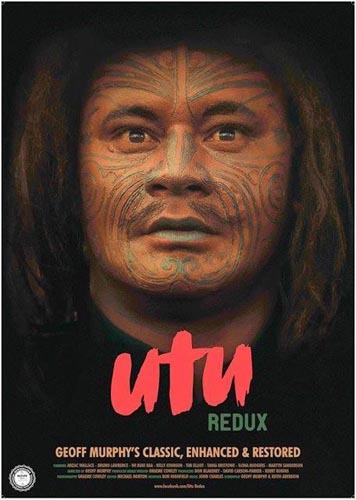 A digitally restored and re-edited version, 'Utu Redux', had its "World Premiere" 28 July 2013 at the Auckland Civic, as part of the 2013 International Film Festival. They (Geoff Murphy, Graeme Cowley, Michael Horton) have made both technical and artistic changes and the result is a 108 minute film, instead of the original 124 minute film whose negatives no longer exists at that length. It is presented in its original 1.85:1 format, enhanced for 16:9. Starting 01 December 2015, Utu Redux is available on DVD and Blu-ray.The 108 minute feature is presented in its original 1.85:1 format, enhanced for 16:9. It has spoken English and Maori, with English subtitles when Maori is spoken. There are multiple offerings: a DVD containing only the feature, about $20nz; a 2-disc DVD set containing the feature, the "Making Utu" documentary, Interviews with Geoff Murphy and Graeme Cowley, the trailer, promotional scene clips and a 12 page Collector's Booklet, about $30nz; a signed limited edition 3-disc DVD set that includes all that is in the 2-disc plus a CD of the soundtrack ($39.95nz). There are two Blu-ray offerings - 2-disc ($39.95nz); and a signed, very limited edition, 3-disc set ($39.95nz) with the same contents as the DVD sets but have a Blu-ray of the feature. All Utu Redux editions are Region Free with two audio options, DD 2.0 and DD 5.1 Surround, for both DVD and Blu-ray. As of January 2018, it would appear that the "very limited edition" Blu-ray 3-disc set is OOP. Starting 07 March 2018, the 2-disc Region B/2 Blu-ray/DVD set became available in a slipbox digibook package with a 40 page booklet in French. The feature blu-ray has optional French subtitles in addition to the original spoken English soundtrack. It is selling for about 25eur. The DVD has the same contents as mentioned about in the original Redux 2-disc set. WorldCat is the world's largest library catalog - Click to find the nearest Library that has 'Utu'. WorldCat is the world's largest library catalog - Click to find the nearest Library that has 'Utu Redux'. Geoff Murphy 1985 Interview - talking about Goodbye Pork Pie, The Quiet Earth and Utu.